Home › Creative Kids › Creative Kid Thursday! Guest Review by Justin! This is a guest review by Justin Doan, author of the blog justintalksbooks.blogspot.com, which features MG and YA books such as Red Queen, books by Stuart Gibbs, and includes his own personal thoughts about books. Feel free to check out his blog and leave a comment! 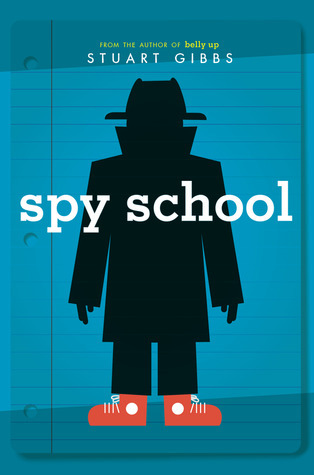 Summary: Benjamin Ripley, a 12 year old living your average middle school life is being recruited for a science academy, secretly a spy school. Oh it’s just another typical recruitment with a top-notch spy appearing in your living room after a long day of school. Ben has a “cryptography” skill and even though he bombs his SACSA’s (basically a pre-assesement in self-preservation) he’s kept in the school because of his “talent” for cryptography. Along the way he meets Erica Hale- the most beautiful girl he’s ever seen, the best student in spy school’s history, and a legacy (she’s even related to all time spy legend Nathan Hale) But the introverted isolated Erica reaches out to Ben and reveals he has no skill whatsoever. Instead, he’s being used as bait for something called Operation Creeping Badger, a plan created by the CIA to weed out the mole in Spy School. Ben decides to hop on the train for one main reason: getting to spend time with Erica. I mean for three years she’s practically been lonelier than a rock on a deserted island and now she reaches out to a nerd like Ben? Not only does it bring us his coolness by a mile, but spending time with your crush is the best feeling ever. But is it worth if it you end up being dead? Follow Stuart Gibbs’s fantastic thriller through elaborate plans, midnight escapes, and lots of gun fighting as Ben and friends try to answer the question: Who’s the mole? Oh and try to not get killed in the process. What I liked: Everything? But seriously, it’s just a well-written book. Humorous moments were weaved well into the diverse book. Lots of actions scenes, which of course you’d expect from a James Bond-esque book. I definitely liked the inclusion of a legacy in a book. I mean if you think about it any time you read about a private school there’s always someone “who’s great grand-father was the founder” or something like that. Not only is Erica’s deceased relatives the founders of the school, but the country in general has been at the mercy of their family. I could talk for about 10 pages of how this book is awesome, but I feel like there wouldn’t be any point to it. What I didn’t like: Let me just start out with saying: the cursing. Yes, there are bad words in this novel, but keep in mind this: I talked to the author himself and he said that he only stuck in the various language because it could give some character to the book, to spice things up. He was advised to do so by somebody (an editor I think?) and so he did and he received a million hate comments for it. He’s removed all bad language from the rest of his books (unless you consider “stupid” “dumb” and “idiot” bad words) Another thing I didn’t like was the classic format for all middle grade books. While it varies, in MG if we’re talking about a kid and school it’s always: There’s a loser at blah blah school. Suddenly he catches a break and he talks to his crush. For half the book everything is really awesome with only minor flaws. Then there’s a huge conflict at the end. The ending is either “YAY! We made it!” or “Aw, we lost” I feel like I could explain the plot of this book at a general level using the normal MG format, and while it’s not bad, it’s just overused. Final Thoughts: A really, really, really great book with some minor flaws but nothing enough to make it bad. Why? Minor flaws but nothing major. Really a great books that keeps things exciting and fresh. It is a really good book. I suggest you read it! Sounds like a great read. (Although I’m not fond of cursing in books.) Great review, Justin!